Thank you to Chris Palmer at Richardson Gratings/Newport for supplying each student with a handbook during the 2010-'11 Pilot Run. 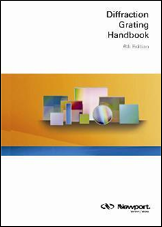 These handbooks are no longer in print but a digital copy can be found below. Also see the Technical Notes at the Richardson Gratings website for more valuable information. IMPORTANT: The diffraction grating will likely be the most sensitive and fragile component in your design, and it is a critical one. Every team member should carefully review the grating handling instructions found in Chapter 15 of the Newport handbook before your grating arrives. Thank you to Chris Palmer at Richardson Gratings for supplying each team with a complementary contest diffraction grating. Teams may select one of three different diffraction gratings to support their science goal. Google Sketchup is required to view the above documents. To get an idea of how the heliostat operates, please see the time-lapse video provided below. The video was taken over approximately five hours. Notice the shadows moving in the background while the bright spot on the ground remains fixed.